"Arin" is a terrific boy...he is game for any and everything and just loves to run! He finished his Oval Racer of Merit title in early September 1999. He finished his oval race Champion title in September 1999, is fairly close to achieving his straight race Champion title and needs under 30 points to finish his Field Champion Title. 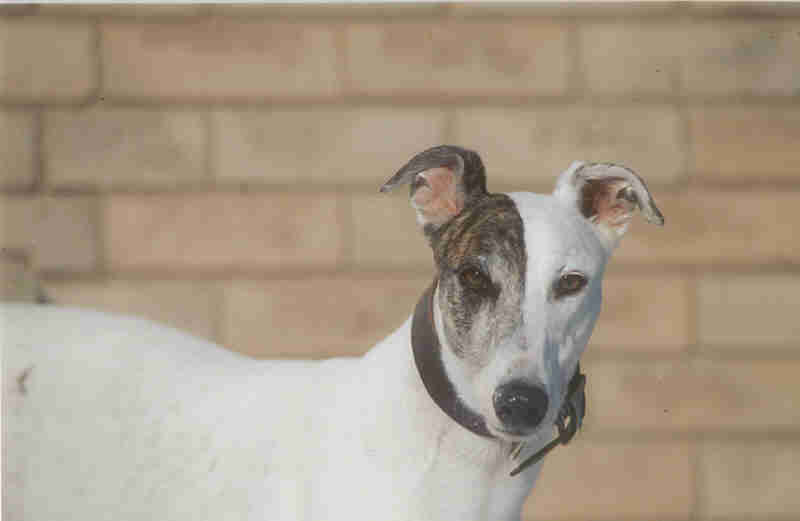 He is bred by Laurie Soutar, Lakilanni Perm. Reg'd. Greyhounds. 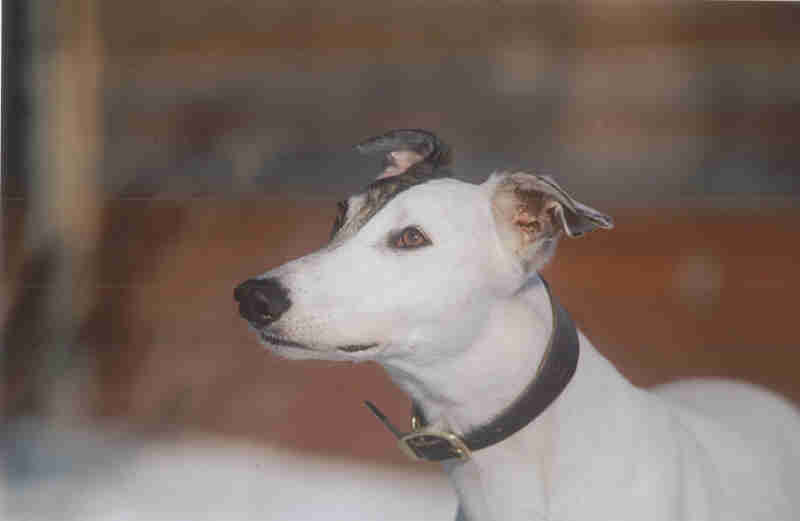 Arin placed #5 Greyhound in CARA Oval Racing 1998. He finished his Show Championship in Feb/98 as shown in the photo at the right. We are happy with our big "clown's" efforts...he really enjoys himself! Unfortunately, Arin ran into some problems during 2001, in that I sent him to self-proclaimed "professional dog trainer specializing in aggressive dogs" Mr. Adam Stone, of Umbrella / Bark dog training (Arin had issues with bullying subordinate and smaller dogs) and we demanded his return from the charge of Adam Stone, finding the dog to be in a terrible state of ill health. As appalled as I was at his condition, I realized I needed to keep a photo record of just how effectively a raw diet and herbal support can bring an animal back from ill-health. If you wish to see Arin's photo-record, CLICK HERE. Another good link to try is the CANADIAN ANIMAL REHAB SERVICES of Jim Wilson R.O.F. & Molly Barber AHT, RMLAT. Their Email address is: animalrehab@neptune.on.ca and Website Address is: http://www.animalrehab.on.ca This company manufactures walking aids such as braces for dogs who have had cruciate ligament damage/surgery, rear & front slings to aid dogs to walk, and have custom-made wheelchair carts for either front-end or rear-end paralyzed animals. 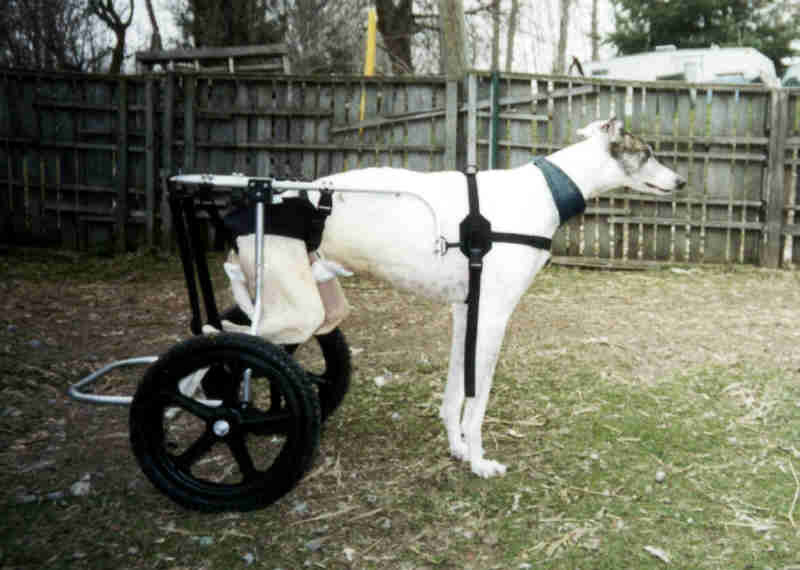 Another good site: www.handicappedpets.com (includes a classified section with used carts available). More reputable links are listed just below. LAVAN UPDATE OCTOBER 4th, 2000: In July 2000 Lavan started to stand and by August was not only standing unassisted but ALSO walking (3-legged, but none-the-less, WALKING!) He is very excited that he is mobile again! We are working extra hard with his therapies to get the 4th leg going. He is starting to show some improvement & hopefully by the end of the year he will be using it in some way.....STAY TUNED! Lavan did the most INCREDIBLE THING yesterday! He actually walked up the stairs to our second floor (14 steps, a landing and then 4 more steps)!!! He blew my mind away. It's the first time in 18 months that he has climbed the stairs....AND since he did it the first time (Sunday September 9th, 2001), he did it again on Sunday and then about 6 or 7 times on Monday and well, he's not looked back since! He can now go up and down and is now totally mobile on his own. He is still rather gimpy when he walks, but that doesn't stop him and he doesn't need me to carry him upstairs at night to go to bed anymore! My arms and my back are very grateful! He is just THE BEST! He has an iron will. We are SO VERY proud of his efforts and tenacity. His motto must be "NEVER GIVE UP". He is a VERY SPECIAL dog! These 2 photos of Lavan are Copyright & Courtesy of Mark Raycroft. Thank you Mark for these beautiful shots of our lovely, sweet boy! 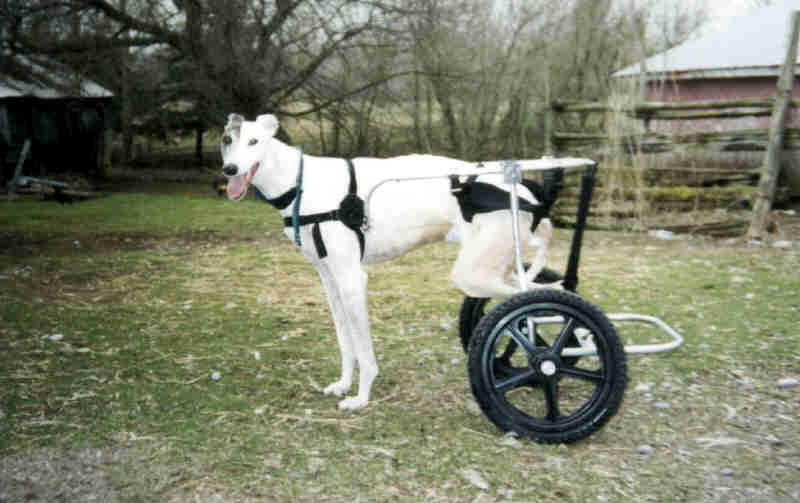 Lavan in his cart from Doggon' Wheels! 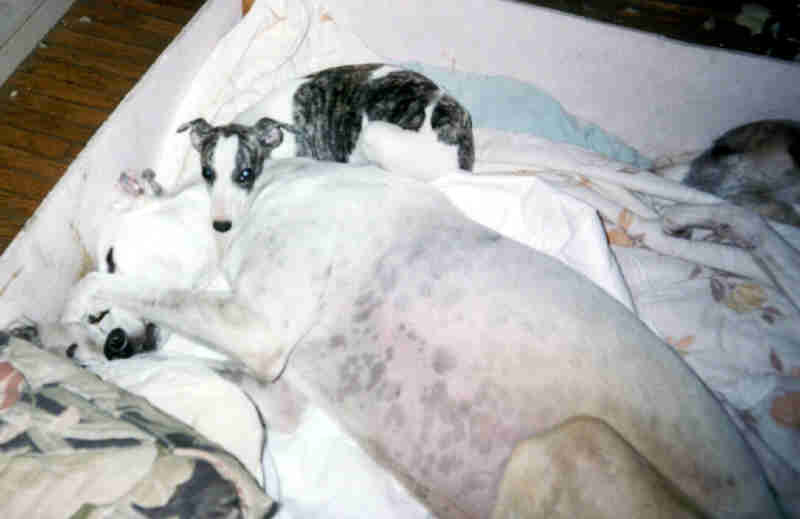 Lavan babysitting & with his favorite whippet puppy, Clio, after his paralysis!